Clarets boss Sean Dyche feels greater strength in depth has given Burnley a better chance of staying in the Premier League this time around. 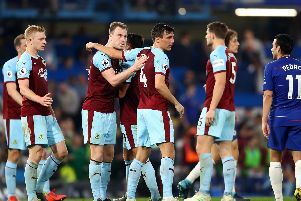 On Saturday, Dyche was able to introduce £6m striker Andre Gray and Ashley Barnes early in the second half to change the momentum of the game, as the Clarets went on to claim a 3-2 win over Bournemouth at Turf Moor. Dyche was also able to bring on £3m centre back James Tarkowski on to help see out the game, as Burnley claimed a fifth home win to climb to 13th in the table. Ahead of tomorrow night’s first-ever trip to West Ham’s London Stadium, where the Clarets will look for a first away win of the season, Dyche said: “The biggest shift we’ve had, is if you look at the group two years ago, and now, we can be really effective from the bench. “That’s not doing anyone down, we didn’t have the depth two years ago. Some pundits have been surprised to see Gray – Championship player of the year with 25 goals last season – on the bench more often than not since his return from suspension, including Ian Wright. Gray’s two starts since have been away from home, at Manchester United and Stoke City, but Dyche has been pleased with his attitude and admitted: “He was so unlucky, he broke away and the keeper made a good save, he got the one in front of goal where he got a toe end on it and anywhere else it goes in. It hits the keeper.